Roux-en-Y gastric bypass (RYGB) surgery may lead to changes in brain activity in regions that process reward and taste-related behaviours, according to a study on rats by multiple research teams from the US. The investigators believe that if specific cerebellar regions have an altered metabolism following RYGB, it may help identify novel therapeutic targets for treatment of obesity. The study, ‘Roux-en-Y Gastric Bypass Alters Brain Activity in Regions that Underlie Reward and Taste Perception’, published in PlosOne, was conducted to examine the effects of RYGB on the brain’s response to the anticipation of highly palatable versus regular food. The study included 58 Sprague-Dawley male rats with 26 rats undergoing RYGB surgery or sham surgery (n = 32) at 17 weeks of age. Eleven of the control rats were assigned to the ad-libitum high-fat (HF) group (Sham-AL), 12 were assigned to the pair-fed HF group (Sham-PF), and 9 were assigned to the ad-libitum normal diet group (Sham-ND). The ad-libitum group had unrestricted access to food and water. The pair-fed group had unlimited access to water, but their food was limited to the average intake of the RYGB group 24-hours earlier. At seven weeks of age, the animals’ body-weights were measured daily (1200-1400h), along with food and water intakes. The pair-fed group received 75% of their daily caloric intake (900-1100h) in the morning and the remaining 25% (1700-1900h) in the evening. The Sham-ND group received standard rat chow (13.5% kcal from fat). All other animals (RYGB, Sham-AL and Sham-PF groups) were given a HF-enriched diet starting at six weeks of age (60% kcal from fat). High fat diet-induced obese rats underwent RYGB or sham operation and were then tested for conditioned place preference (CPP) for the bacon-paired chamber, relative to the chow-paired chamber. After CPP, animals were placed in either chamber without the food stimulus, and brain-glucose metabolism (BGluM) was measured using positron emission tomography (μPET). Scans were performed twice per animal, once in each chamber in counterbalanced order, and BGluM measurements captured each animal’s anticipation for food while exposed to each food-paired environment. As bacon is a highly palatable food, a positive correlation between BGluM and preference for the bacon-paired chamber was expected, especially with regions associated with hunger and reward, notably the hypothalamus (homeostatic consumption) and NAcc (non-homeostatic consumption), respectively. The researchers also hypothesised that RYGB influenced regional brain activation to food cues. Differences between HF- and ND-animals were noted five weeks after diet initiation; HF animals were significantly heavier at the time of surgery (p<0.001). Post-hoc comparisons (Dunn’s method) revealed that RYGB and Sham-PF rats were significantly heavier than Sham-ND (RYGB: Q = 4.03; Sham-PF: Q = 2.994; p<0.05). There were no differences amongst the three HF groups. After surgery, immediate weight decreases were observed in all groups, with the greatest decreases observed in the RYGB group. By the start of the behavioural and neuroimaging experiments, weight loss was only observed in the RYGB group, while in the sham-operated animals weight gain was observed. To determine bacon-cue preference (time spent in the bacon chamber, relative to total time exploring), the researchers compared CPP between test-sessions and across groups. Bacon-cue preference was significantly different between pre- and post-conditioning trials (p=0.013). There were no differences in CPP between groups (group main effect: p=0.112; time × group interaction: p=0.155). Statistical Parametric Mapping (SPM) analysis revealed significant differences for the contrast bacon > chow for RYGB and AL (high-fat) groups (Figure 1) but no differences for the contrast chow > bacon for any of the groups. 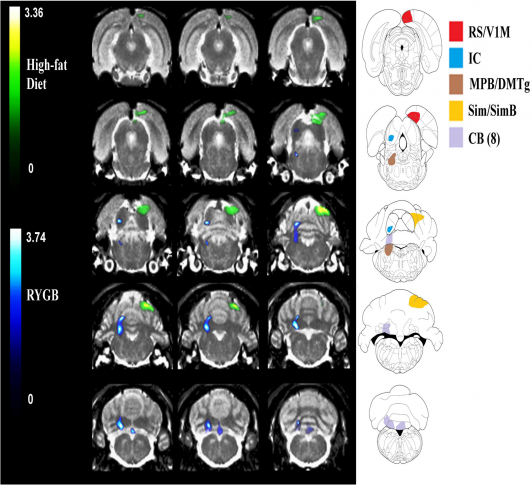 For RYGB rats, one cluster was observed that included the right hindbrain (pons), the right and midline cerebellum and the medial parabrachial (MPD) and dorsomedial tegmental area (DMTg). For AL rats, one cluster was observed that included the left CB (Sim), CB (SimB), and retrosplenial area (RS) and the right primary visual cortices (V1M). For RYGB rats, regression analysis showed that BGluM in right cerebellum to bacon-paired cues predicted preference for these cues. That is, individual responses in the right CB (lob 8) during exposure to the bacon-paired chamber were found to significantly correlate with preference for this chamber on both Test Days 1 and 2 but not during Habituation. No other significant correlations were observed. The study was conducted by researchers from Stony Brook University, NY, Mt Sinai Medical Center, NY, SUNY Upstate Medical University, Syracuse, NY, NIH, Bethesda, MD, NIH, Baltimore, MD, Brown University, Providence, RI, and Penn State University, Hershey, PA.